Left: Two Binoculars in One automated presentation; click "Start Film" to view. This is a Macromedia "Shockwave" film and so your Web Browser must be suitably enabled (157,030 bytes). What Makes The Duovid Unique? Introduced at Company Seven in June 2002, the Duovid 8 + 12 x 42 binocular heralds a new era in binoculars. This 50mm binocular (and its cousin the Duovid 10 + 15 x 50 introduced in February 2003) are the first high performance binoculars available worldwide capable of providing the user a choice of two magnifications (and with no need of diopter adjustments, a third too). Instead of just a single magnification as is found on conventional binoculars, the Duovid features both a 8 power magnification capability as well as a 12 power magnification setting. The 12 power provides rich details, each with outstanding optical performance throughout. While evaluating the binoculars at Company Seven we have found the magnifications may also be set at 10 x offering an intermediate position better suited for some who may not be able to hold a binocular steady at 12 x. But the real surprise for us at Company Seven is how well balanced and properly weighted this instrument is in the hand; it has become surprisingly pleasant to use from 8 x up to the 12 x setting even by visitors in our showroom who would not usually use a standard 12 x binocular! With its range of magnification settings the Duovid offers it's owner independence, and that great feeling of being well equipped for any situation. It is well suited or perfect for many applications, delivering brilliant images both at great distances and in critical low light situations. A good overview is achieved with 8 x magnification, with an absolutely steady image and a large field of view. Switching over to the 12 x magnification places you even closer to the action, with an extraordinary imaging performance, even of the very smallest details. Now hunters, bird watchers and leisure-time observers can rely on a single versatile binocular that can be tailored to any activity. Outstanding ergonomic design permits shake-free observation for most observers, even at the higher 12 x magnification. Right: The Duovid 8 + 12 x 42 is available (as are all 42mm models) in the customer's choice of either Slate (Black) or in Green. Illustrated the two Leica Duovid 8 +12 x 42 binocular choices with eyecups in retracted position, furnished Rainguard shown in forefront (79,531 bytes). The Duovid joins the Leica line of 42mm binoculars representing their best possible optical performance coupled with an incredibly compact yet rugged body design. This was achieved by the application of state of the art computer aided optical design, and by the use of the latest generation of special high grade optical raw optical glass materials, as well as the high grade structural materials including magnesium and aluminum alloys. The Duovid rivals many premium standard binoculars in contrast, clarity, and in field of view too! We were pleasantly surprised to find the actual field of view is quite good, a true field shown of 6.9 degrees when operating at 8x, and 5.1 degrees at 12 x - each as sharp and clear as the other. And surprisingly, when our technical staff evaluated the first production models we were pleased to find that with some practice, the magnification settings may be adjusted to provide 10x ; this is not mentioned in the Leica literature but we find this to be very attractive for those who may seek higher magnification than 8X but on some days (such as during a strenuous walk) may not be able to hand hold the binocular at 12x. The limitation when selecting the middle setting is that one can not use the Diopter Adjustment mechanism however, this is not a practical concern for someone who has eyes that are equal in focus, or who use prescription glasses or contact lenses. 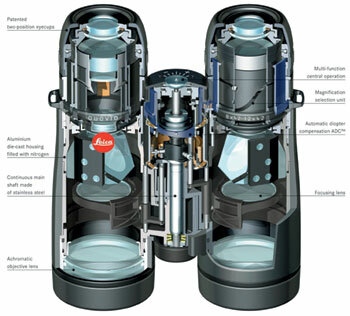 Left: Leica Duovid 8 +12 x 42 binocular cutaway view. 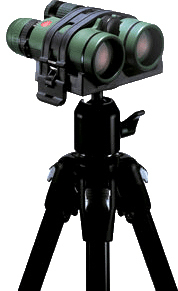 Labels point out the Patented two-position eyecups, Aluminum die-cast housing filled with dry nitrogen, Continuous main shaft made of stainless steel, Achromatic objective lens, Multifunction central focus operation, Magnification selection unit, Automatic diopter compensation ADC™, and Focusing lens (30,469 bytes). "When one begins to appreciate the precision components and excellence of design that goes into a premium binocular, then one can only wonder why they do not cost even more than they do"
As with other premium Leica binoculars which we sell, this instrument incorporates state of the art durable "HDC™ antireflection coatings on each of the air spaced components. In Leica's "HDC™ coating process the highly polished and cleaned optical components are placed in a chamber which is pumped to a high vacuum. Then a computer controlled vapor deposition process deposits the elements in the coating compound in the proper order, and to the proper uniform thickness - this is on the order of microns thick. The antireflection coatings applied in this manner are highly resistant to external influences. The prisms incorporate "P40" Phase Correction coatings to make the light throughput more uniform across the visual spectrum. Other technical refinements of this innovative binocular include Automatic Diopter Compensation "ADC™". The change in magnification is accomplished separately for each of the two binocular barrels by rotating a ring - one on each tube. The magnification for the diopter adjustment is automatically conformed through an internal lens (ADC™). The Automatic Diopter Compensation is achieved in by a gear and cam mechanism, it is also coupled to the diopter adjustment mechanism (to compensate for differences between the observers eyes). When the magnification of the Duovid is adjusted at the eyepiece then mechanism moves the focusing lens forward or backward within the binocular barrel. The patented adjustable position eyecups are another highlight. Even though they provide two click stop settings intermediate positions are possible so by dialing in or out gradually they allow optimal adaptation to individual requirements. These eyecups are easily removed for cleaning of the eyepiece or eyecup, or simple replacement. The die cast aluminum alloy housings, and nitrogen filling precludes internal fogging of the optical components. While rubber armoring available in black or green, in combination with the ergonomic form provides a secure grip even in damp weather or when gloves are being worn. Good design and seals insure the binocular is practically speaking, water proof - and this is certified to a depth of 5m (16.4 feet)! The rubber like armoring cladding of the binocular exterior feels quite good to the touch, not "sticky" and yet not smooth and slippery. The covering has a dry yet mildly textured, almost padded feel that is very comfortable in the hand, and reassuring when trying to hold the binocular in wet environments. The waterproof Central Focus control is easy and smooth to operate, even when wearing bulky gloves. And still the focus and diopter compensation controls are not at all obtrusive (as in some "designer" binoculars we have seen lately). This covering looks good on a Duovid in either Slate or Green! Duovid is in that class of binocular that one may only have to buy once to obtain a lifetime of good service. 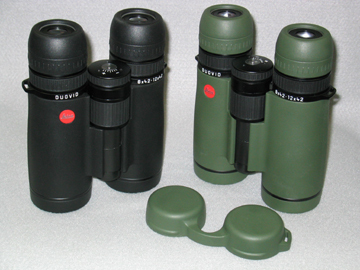 Left: Leica Duovid 8 +12 x 42 binocular in Green with optional Field Tripod and Tripod Adapter (32,154 bytes). The 8 power binocular is often considered a universal good choice since it is suitable for so many applications. The 8 power magnification allows very good versatility for travel, sports, nature watching, and scenery. For studies of more distant birds of prey, scenery, events, or on large open hunting grounds where observation is often conducted over great distances, or for looking at small targets close up or for reading tag information on birds, then the 12 x magnification is ideal providing an image that is fifty per cent larger than that provided at 8 x. When the setting is approximated to 10 x this position may be useful for some compromise situations too! In beginning twilight, observation at 12 power magnification is rich in details because of its extremely high twilight factor. As darkness begins to set in then you may prefer the 8-power setting because of its greater apparent image brightness due to the larger 5.25mm diameter exit pupil (vs. 3.5 at 12 x), and the larger depth of field which facilitates obtaining critical focus even in low light. With this degree of versatility, and relatively high magnification capability the Duovid may be left in place attached to an optional field tripod for convenience. and the automatic diopter compensation ADC™ constitute an outstanding new class of performance. The Duovid 8 +12 x 42 compares very well with top binoculars with fixed magnifications." Holster: To make it even easier to carry and deploy Company Seven offers an optional "holster" custom fitted to hold this binocular. This is made of heavy duty leather, finished in black. It is similar in quality and construction to conventional heavy duty leather pistol holsters. This accessory can be attached onto a belt and it incorporates a leather strap to keep the binocular in place. The holster protects the objective (front) lenses of the binocular, and we include a smaller leather strap to attach the furnished binocular rain guard onto the binocular to protect the eyepieces. The holster provides excellent protection, and ready access to the binocular while hiking or climbing. Furthermore, one no longer needs to carry the binocular with the strap, it now becomes a quick and simple matter to "draw" the binocular and share it with others without the nuisance of having to clear a dangling strap over your jacket hood, hat or sun glass straps. Hard leather Case: The Duovid is furnished with a soft leather pouch. For transport or storage in harsh environments then you may choose to buy the optional fitted hard leather case for the Duovid. Tripod Adapter: for those who prefer the convenience of a tripod mounted view, Company Seven offers an optional tripod adapter. The accessory allows the owner to leave the binocular set in a convenient location to observe birds at a feeder, or for surveillance applications. Floatation Strap: the binocular is furnished with a padded Neoprene carrying strap but for uses around the water, Company Seven provides a high visibility orange strap lined with just enough buoyancy to keep an attached Duovid binocular from sinking in salt water. This is similar in appearance to that strap which we provide with the Leica 7x42 BN Marine binocular. Custom Accessories: Company Seven supports those products sold by us with a variety of custom accessories and platforms for terrestrial and astronomical observing including parallelogram counterbalanced mounts, Nebular Filters for skyglow reduction, and filters for the safe observing of Solar Eclipses! Please inquire. "Leica DUOVID 8 + 12 x 42 and 10 + 15 x 50 Binoculars". Seventy one page illustrated instruction manual with specifications describing our Leica DUOVID 8 + 12 x 42 Binocular and the Leica DUOVID 10 + 15 x 50 Binocular introduced at Company Seven in 2002. Content is in German, English, French, Italian, and Spanish. Publication content by Leica, all rights reserved. From Company Seven's Archives. 344,971 bytes (in Acrobat Reader ".pdf" format). "Leica Sport Optics / New Products 2002 : LEICA DUOVID 8 +12 x 42 Binocular". This is the complete nine page color illustrated brochure describing our new Duovid 8 + 12X 42mm Binocular, and the new Leica Duovid/Tripod Adapter. Publication content by Leica, all rights reserved. From Company Seven's Archives. 283,739 bytes (in Acrobat Reader ".pdf" format). "Leica Nature Observation 2007: Binoculars, Rangefinders and Spotting Scopes". Complete 102 page, stunningly color illustrated brochure describing our Leica sport optics products including the ULTRAVID HD binoculars and APO-TELEVID spotting telescopes announced in August 2007. Publication content by Leica, all rights reserved. From Company Seven's Archives. 6,734,031 bytes (in Acrobat Reader ".pdf" format).